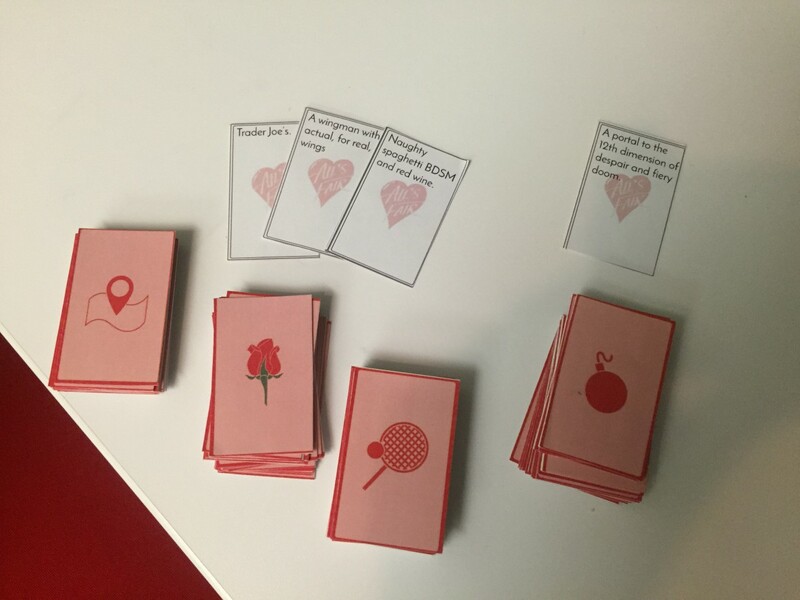 All’s Fair is a party card game in which two players take the role of suitors attempting to seduce the third player – the bachelor. They build and pitch dates that they feel will be effective, and then ruin the other’s date with wildly inappropriate and sometimes disturbing sabotage cards. Compete with one another for the affection of one other with ridiculous, but enjoyable dates. Ruin relationships and possibly friendships as you absolutely trash those dates. Attempt to learn the exact dating interests of friends or strangers in a bid to best seduce them. Created for an out-of-class, but in-school project.